Does this make one muffin pan? I followed the recipe without any changes, and it was delicious! It’s a keeper. These are delicious. I used only whole eggs (instead of whole eggs and egg whites). I made mine with bacon and green onion. They were delicious, easy and look great. I will definitely make again. Did you use 6 whole eggs? I love these. I use Canadian bacon for the meat. These are fantastic. I use Canadian bacon for the meat. I absolutely LOVE these!! I was wondering if these can be made using only egg whites and what type of changes need to be made if that’s possible? I live on these, for a grab and go breakfast! My hubby notifies me when we are running low! How can I keep them from collapsing after they come out of oven?They’re still a big hit in my house! I stopped measuring and just eyeball it using whatever veggies and sausage are on hand. Recommend a rough chop to the spinach. I spray liberally but they stick in non-stick pan for me too! I made this for a friend’s brunch. I substituted broccoli for the veggies & shredded chicken for the kielbasa. It was 1 freestyle point & everyone loved it! I think Mindy Kaling just made your recipe on her IG stories. She mentioned the recipe called for turkey kielbasa … and I also saw she used bell peppers and spinach. My family loves these. I make a batch on Sunday and we pop them in the microwave for instant weekday breakfasts. BUT they stick to my non-stick muffin pans, which are sprayed with olive oil, and they are a bit of a mess (delicious, but a mess). I’ve tried pulling them out hot and cold, and they stick both ways. 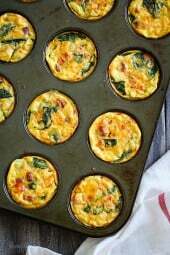 Has anyone had success using silicon baking cups with the mini quiche? I used silicon muffin cups and they came out easily cooled and hot. I have used silicon baking cups and I will not go any other way now. After using muffin pans and getting the quiches/frittatas stuck every time (and how I hate cleaning those after!) I tried the silicon cups and they are absolutely amazing. You don’t even have to grease them. 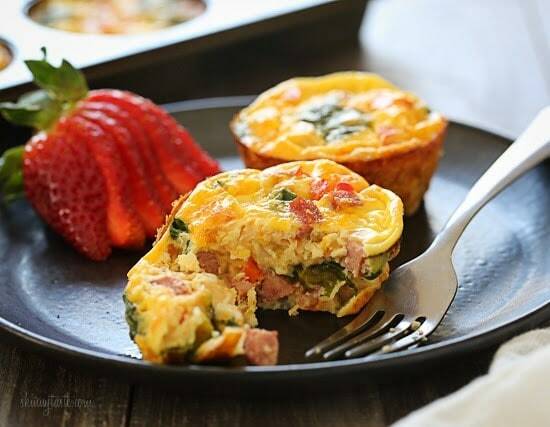 The frittatas/quiche pop right out of the cups. Perfect every time! I want to use whole eggs only, how many would I need to add? Love these – quick, portable, healthy & taste great! Thank you! Could you tell me what the calories per serving would be if you made them veggie? Thanks! These are AMAZING! Thank you! I enjoy grab and go, make ahead meals. It helps eating healthy throughout the week doable. I appreciate your menu plans and your grocery lists too. I’ve lost 25 lbs since April using the aids. I finally made these after seeing folks posting it on WW like forever. They did not disappoint. I omitted the milk and used fat free cheese. I had a bit more left over for some reason and put into a small loaf pan for two extra pieces. I used extra spinach and 1/8 cup diced up mushrooms left over from another recipe. Yum! Love that they are ready to go after 1 minutes in the microwave. 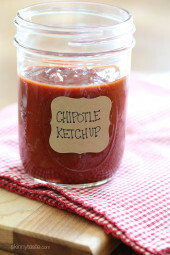 So easy to make and delicious!! Made them exactly according t recipe and did not find them the least bit spongy. Warmed up well to in the mornings. Just the right amount to make me feel full and satisfied. Will definitely be making again! Was craving a healthy cheesy dish and this hit the spot!!! I cooked the squash earlier in the day to get all the water out and it wasn’t soupy at all. Will make again and would definitely recommend! The only change I made was to chop the baby spinach a little before cooking it, thinking it would be easier to handle when filling the muffin cups. Two of these muffins and a cup of coffee for breakfast is very filling. They’re delicious. I made these for the first time last night. They were delicious! I have one question, though. When do you add the salt? At the beginning, it says to saute the salt with the onions. Later, it says to whisk the salt into the egg mixture. I may have put a little bit too much salt into the recipe, but they are still very good. I just wondered for when I make them again. Delicious! I made them vegetarian by just omitting the turkey kielbasa and using whatever leftover veggies I had around. They turned out great! This is a great recipe. I’m not a fan of kielbasa, so I substituted al fresco chicken and feta sausage. I also used almond milk. According to recipe builder in the app, making those two changes brought it down to 2pts/serving. I wasn’t looking to do that, but I’ll take it. I also put the whole thing in an 11×7 dish and baked for 40 minutes. 12 squares. 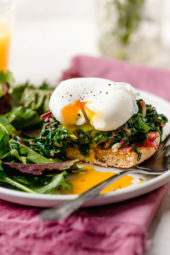 Any thoughts on how to do this with an Egg Substitute? Wife is allergic to Egg and Dairy…but we are looking for ways to make easy make-ahead breakfasts? 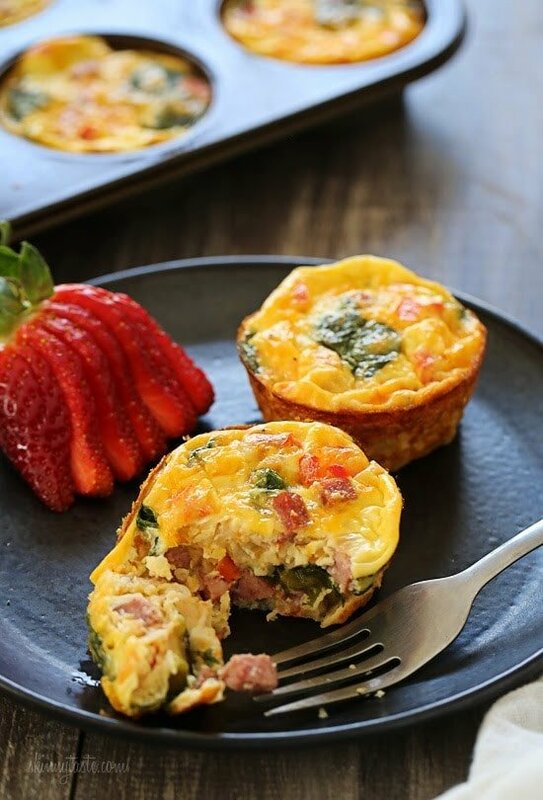 I have made several different types of breakfast egg muffins the past few months, and these are by far the best! My husband and son went nuts over them, and I’m glad I made a double batch so I will have some for my breakfast this week. Don’t be alarmed when you add the flour to the egg mixture. It looks like the flour doesn’t get mixed in, but somehow it all gets cooked into a delicious, smoky, veggie, breakfast egg muffin that your whole family will love. You’re welcome MaryAmalia! Glad you enjoyed them! I add sautéed mushrooms, peppers, red onion And of course the spinach, cheese, eggs etc. I’ve made them with ham or crisp bacon or ham. These are lovely I made them with chopped up shrimp as I don’t eat other meats !!! I have not even tried this recipe yet, and already I am pissed. All I asked for was a copy of the recipe and I got about 30 pages of gobbly gook. What I really wanted turned out to be just 3 pages. what a waste of paper. I got pages of reviews, which I did not want., If I want a review I will read it, I don’t want pages and pages of reviews. Then there were pages of advertisements, I diffidently don’t want them. Last week when I discovered this site, I was able to print of the weeks menu, and print each recipe as I wanted it. Your site just uses too much paper. Why didn’t you use the print button? Made this recipe for lunch as a friend came over, with bacon instead of turkey. I also halved the recipe (with two whites and three whole eggs). She really liked them, and so did I too. I usually find ‘egg cakes’ too eggy, but these were perfect. Definitely going in my ‘Repeat File’. Thanks. 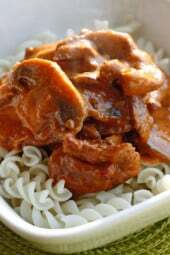 I have never rated a recipe but I had to rate this one! Fantastic! I can’t wait to eat one tomorrow AM! I made this yesterday and it turned out great. I used turkey breakfast sausage and bacon pieces otherwise I followed the recipe exact. Will definitely make it again. Would be great for a potluck. We served it with other breakfast items as part of a brunch buffet. Could you substitue almond flour and heavy cream to make them Keto friendly? Or, what would you recommend? You can leave out the flour and add an extra egg. Love these!! Made them several times and not sure why some have trouble getting 12 quiche. I used shredded zucchini instead of spinach since I’ve got oodles of zucchini (all the more to make zoodles with, LOL). Just “eyeballed” veggies so might have used more than recipe called for but easily made 12. Don’t fill muffin tin all the way as they will fluff up a bit. I squeezed out excess water from shredded zucchini. THanks Gina for another excellent recipe!! Can this be made in a regular pie pan? Hi Gina! I love these type of egg muffins. Never used flour so I was wondering how many eggs to use if I use whole eggs. It sounds like the flour provides different texture. I’m afraid to mess it up if I don’t follow the recepie exactly. I’m a whole egg kinda gal ? This was absolutely awesome. Very, very tasty and filling. I shared some with a co-worker who is doing weight watchers and she loved it as well. Because they were what I had on hand, I subbed gruyere for the cheddar and a chicken sausage for the kielbasa; if anything, this lowered the sodium content but didn’t really alter the calories! I made these and think they are delicious. I will be adding them to my breakfast list. Good morning, these are delicious! I have made them a few times but I would like to make this recipe as a casserole this weekend for my Dad for Father’s Day. What size dish would you suggest I use? I have put these in my breakfast rotation for the week. I had them in the freezer and in the frig and both times came out great when heated up. I did use chicken sausage instead and when heating up and a little cheese on top and some salsa. Making again today and will skip the meat and a little more cheese and vegetables. I make these a LOT!! I change up the veggies and meat depending on what I have on hand or what I feel like putting in them. My husband and I love them. A great, healthy breakfast that we can heat up quickly in the morning when we’re trying to get out the door. I have also tried some of the other quiche/muffins and breakfast casseroles. They are great as well. However, we keep coming back to these as they are so easy, tasty and don’t take up a lot of room in the fridge. Thanks, Gina!! I changed these up a little. I used 6 eggs and no egg whites, and added 1/3 rolled oats instead of flour to give them a little more fiber. I also added leftover vegetables (asparagus) and chopped fresh parsley. With a silicone muffin pan, clean up is a breeze. Have to say I am very pleased with the results! These are crazy amazing. Great depth of flavor but still healthy. I am so excited to eat these every morning. Thank you Gina!!!!!! I just had these. Delicious! I will be making them again. I used what I had on hand so I used spinach, canned artichoke, onions, and jarred pimentos. I froze half. For some reason I get 6 smart points as the value, but well worth the effort. Thanks! I just made these and I had a hard time getting the lumps of flour out and getting it smooth. Is the flour necessary? I haven’t tried them yet, they are still cooling. I’m sure they will be delicious. Will they be ok in the fridge for the week? Or should I freeze? I love these! However, my muffin tin took a million years to clean the egg out of. Did I perhaps not use enough spray? Any suggestions? I want to keep making these, but they kinda ruined my pan. I also spray my muffin tin with non stick cooking spray. I’ve also found if I let me cool off quite a bit, they come out easier and leave less of a mess. I have made these twice. They are delicious as written. This time I used turkey sausage for the kielbasa, salsa for the tomato, onion and peppers, mozzarella and parmesan for the cheddar. I also added mushrooms. Still delicious. Thank you for making my breakfast so easy. I have a different fruit each morning with my little quiches. Today it’s strawberries and kiwi. I made these for Easter Brunch. Everyone loved them, even our friend who complains about anything “healthy”. I also made them without the meat for our vegetarians. I made this recipe this morning. I used 3 oz (1 cup) of 2% shredded cheddar and 1/3 cup of 1% lowfat milk and my points for Freestyle came out the same (5 points per serving of two quiche). Delicious! These were great. Quick question though…does the nutrition info for include the calories etc for thr “free” WW foods? Thanks again! These were so easy to make and so good! I made this ahead on Sunday for many of my breakfasts, and am freezing what I don’t finish. It made all the guesswork for breakfast in the morning vanish. The kielbasa sausage takes this to the next level and I’m getting veggies in the morning. Thank you so much for another fantastic recipe! These were really good. Will definitely make them again. Really liked the turkey kielbasa. I made these last night. What a delicious way to start my day this morning. Thank you! I really love bake ahead breakfast quiche, I’ve done it over the past 4 years. My only thing with your recipe is I don’t understand why you use flour. I’ve always added basically all these same ingredients without the flour, and they come out awesome anyway. Can you tell me, have you tried this same recipe without flour? I make basically these on the regular. I’ve never added flour and I think they’re great. To make things even easier I love chopped green onions and I typically don’t saute veggies beforehand. I love chopped raw spinach in them. I think it improves the texture, less spongy. I’m following your week plan while also tracking for Weight Watchers. My fiancé and I really enjoyed these! I thought they’d be too small, but they’re just right. 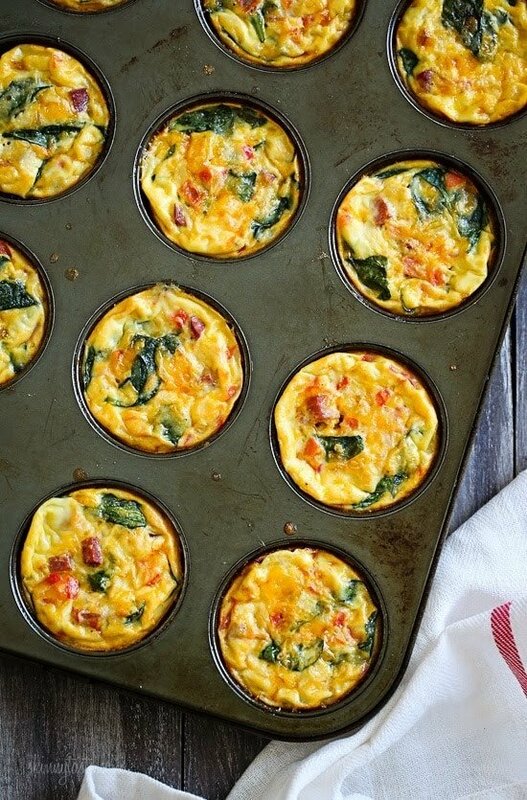 Are you using regular size muffin tins or mini? I made this yesterday for my breakfast rotation. Have to say, I’m not lovin’ It. It seems spongey, and the sausage taste seems to dominate over all the other ingredients.